The big building at Marijin Dvor, fifty metres from the Parliament, has not even been completed. There's a whole part which, for the moment, is still empty and where they are only just beginning to put in the windows. It will be finished in the coming months and in future will house offices and flats. At present just the base of the building is open to the public, four floors primarily spread horizontally which make up a shopping centre – the fourth within a kilometre radius. According to the owners' statements, the Sarajevo City Center will create 1,500 jobs in the various sales points in the 49,500 square metres. Quite an achievement. It's not easy to describe the state of mind of the townspeople at the news of the opening. In fact, the inauguration took place at a critical moment for Bosnia Herzegovina, a month after the protests in which the population rebelled against twenty years of parasitic government. Participation in the inauguration ceremony, however, was comparable in size with the first citizen's plenum and over ten times greater than the present level of protests which continue daily in the capital, but can no longer bring more than thirty people out into the streets. The contrast between these “two Sarajevos” is inevitable and can be felt in the comments of the man in the street: while for some “the only real gift would be a factory, certainly not shopping”, others are less critical about Al-Shiddi's creation. 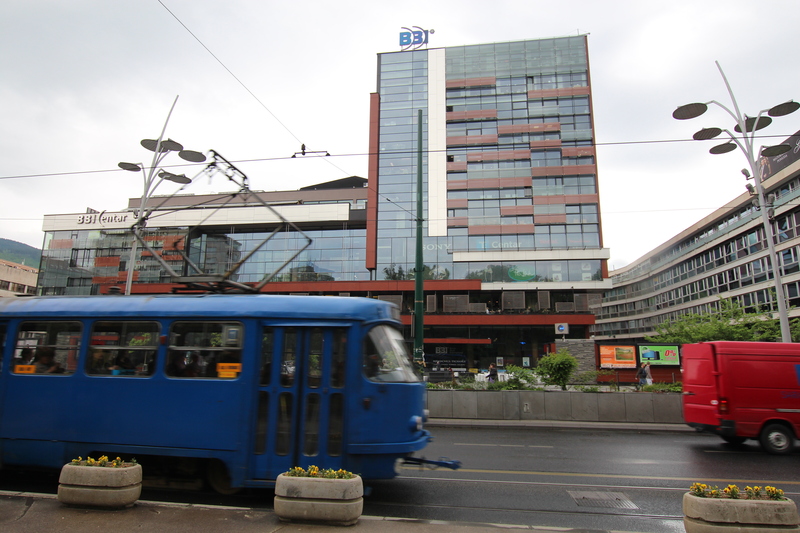 A commercial activity also creates jobs, and a new temple of commerce, in which famous brand names will figure (in particular Zara, which has opened its first shop in the city and which Sarajevans had fantasized about noticeably in recent months) is also synonymous with novelty and change. Does shopping cost less than the psychiatrist? After three weeks, understandably, the euphoria of the first days over, curiosity about the City Center gradually subsided as well. Looking in there today, you find a hundred or so people strolling round the boutiques. Few actually buy anything, and those who can afford it just fish out the odd Tshirt on offer, paying only a few marks. On the other hand, the bars in the Center are full, as are the game rooms on the third and fourth floors. Shopping centres in Sarajevo seem to have more of a recreational or socializing function than a commercial one and the City Center, like the others, is a place for having a coffee or eating a slice of pizza. Overall, the complex seems like a monument to the myth of shopping rather than the place where the ritual actually takes place. In the entrance a girl is immortalized by her friend in front of a poster of smiling models. The walls are plastered with slogans, quotations, aphorisms in English and Bosnian: “Whoever said money doesn't make for happiness, simply didn't know where to go shopping”; or again: “Women need food, water, compliments and from time to time a new pair of shoes”. (A complete gallery of these has been put together by Radio Sarajevo). Majstorović goes further, trying to explain the formula for the “success” shopping centres have had in recent years. “It needs to be said that here in Sarajevo there does exist a social class which, however limited, can actually afford to enjoy its salary. The relatively well-off 'middle class' is not entirely made up of international organization employees.” But it is also true that, “among the local people a certain mentality is widespread, encouraging them to live above their means and creating a distorted sense of priorities”. If it's true that the Bosnian population is poor, it's also true that incongruous situations are to be found. According to the World Bank, one Bosnian in 5 lives below the poverty line (data shown in the 2013 report). The average wage is about four hundred euro. Despite this, in 2012 about 85,000 luxury cars were sold in the country, Večernje Novosti wrote. And many travel agencies (Centro Tours, Relax Tours and Nebo Tours, just in the capital) when they organize trips to Italy, unfailingly fit into the itinerary a visit to the outlet in Palmanova, a necessary waystop on excursions to Venice and Verona. The agency Damy of Sarajevo had even devised the three day packet consisting of one day departure, one day shopping, one day return. The cost? 65 marks. This attempt, however, was not very successful, the agency told us: “In fact only ten people enlisted. The prices in Palmanova are generally too high for our wallets”. The fact, though, that from Bosnia Herzegovina one can envisage a journey of three days and six hundred kilometres uniquely in order to visit an Italian outlet, poses interesting questions on the relationship between the citizens and constructions like the City Center. Perhaps Bosnians cannot afford to buy, but apparently it's true that the shopping centre formula has a certain fascination, as if one could be satisfied by gazing at the “capitalist dream”, the Europe outside, sipping coffee at one of the tables between the shop windows, rather, it seems, than at one of the many kafane in town. This reality is regularly confirmed in every Sarajevan shopping centre. “Here with us, the opening of the City Center has made no difference, people are here in the same numbers as before”, say the waiters at the bar and the staff at the checkout in the BBI which on April 5th celebrated its fifth birthday with a big concert in Djece Sarajeva square. The date chosen for the inauguration, April 6th 2009, was not fortuitous, being that of the Sarajevo day of celebration when the liberation of the capital from the Nazi occupation in 1945 is commemorated, and which coincides with the beginning of the seige in 1992. Some years earlier, on April 6th 1975, at exactly the place now occupied by the BBI, the very first shopping centre in the town was opened – the Unima, rapidly renamed Sarajka by the inhabitants. For the first time, under communism, the future of the city and sense of progress were directly linked to the setting up of a large store. Over time the Sarajka became one of the symbols of the city and perhaps its destruction in the war explains, in part, the fascination shopping centres hold even now for Sarajevans: “One day the Sarajka appeared in all its beauty and splendour, symbolizing, in a growing society, faith in the future and progress,” wrote the artist Nebojša Šerić Šoba years ago in his personal blog, describing his return to the city, commenting on the destruction of the old shopping centre, where the foundations were beginning to be laid for what was to be the BBI. “At first I tried to take heart by telling myself that, after all, the Sarajka was just an ugly building. But actually it was not so awful. There I bought my first guitar, my first bottle of wine, records of Led Zeppelin and Deep Purple. When I was a boy it was a place full of games, all you could wish for. A magic place”.